Today we are launching beta versions of the first five units of a new ebook called Economy, Society, and Public Policy. When we created The Economy—our ebook designed for introductory courses for economics students—we were constantly struck by the enthusiasm and curiosity of the students we surveyed to find out about how people interacted with each other and the natural environment to provide their livelihoods, and how that changed over time (and how policy and citizens could effect change). We tried to inspire students with a toolkit that they could use in future to turn their curiosity into new insights. It would be ridiculous, though, to assume that every learner who feels that hunger is already enrolled on an economics course. Curiosity about the world, our place in it, and how it changes and can be changed is a feature of almost every field of study. But we also heard, from both teachers and students, that economics for students with other majors, or for those students who were still considering which major to take, seemed abstract and unengaging. Using The Economy for courses designed for non-economists comes with a steep learning curve for both teacher and students. Hence, we wanted to produce units that are inspired by our previous work (and which share some of the discussion, figures and models), but are accessible to a wider range of students. That is why we are creating ESPP, together with the same number of empirical projects under the title Doing Economics. ESPP is also unusual among economics texts because we bring in the study and evaluation of policy, whether that policy addresses a sugar tax or tax avoidance, at the beginning of the course—rather than treating policy analysis as an afterthought. ESPP will be innovative because we will focus not only on learning economics, but on using real-world data to teach data-handling skills that are becoming valuable in many courses, and many jobs. As well as short data-handling exercises in the units, we are creating a set of standalone projects in which students will learn by using real-world data to investigate a policy problem, called Doing Economics. We have posted the first five of these Doing Economics projects in Excel format. Others will be posted as we finish them, as well as versions that use (and so help students to learn) R.
Why release beta units now? If you have an existing need, use them now. Although this is the first beta, the units are complete and have been reviewed by experienced teachers. Use them to evaluate whether ESPP meets your needs. The other units, plus supporting material, will be published online during 2018, in time for the Fall semester. We hope many of you will be inspired to use our material in your course. We want your feedback. Every response is read and noted, wherever it comes from. It improves the units we have finished, and guides our work on the ones that are still being created. As with The Economy, we will use your opinions to crowdsource a better textbook. If you want to see what ESPP can offer, dive in. 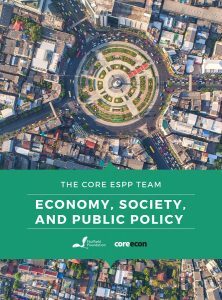 Like all our material, ESPP is free, and open-access. To hear more about the thinking behind ESPP from a few of the people who have been instrumental in its development, listen to this short podcast (9 mins). If you want to see a walkthrough of ESPP’s features, have a look at this video walkthrough of the new units. As usual, @coreeconteam will be active on Twitter, answering your questions and listening to your comments.